Spring is in the air! What a better way to enjoy the beautiful campus of Miami University than to have a picnic outside with your closest friends! Picnic on the Patio will be on April 23rd and we hope the sun will be shining and everyone in in attendance to enjoy a beautiful day and fantastic meal! Miami University is filled with skyline lovers and of course we are all so excited to be able to celebrate National Chili Day! Grab your closest friends and head to any dining commons on campus to celebrate this very important holiday. Not only will the dining commons be serving Miami’s Chunky Chili, which is one of the most amazing things I have ever tasted on campus, but it will also be serving Cincinnati Chili! There is no better way to celebrate Black History Month than having delicious food with your friends at Western Dining Commons. On February 21 from 11:00 a.m. until 8:00 p.m., the international station at Western Dinning Commons will be holding a partnership with the Black Student Action Association. Stop in at any time to celebrate and eat a delicious meal! Both of my parents are master cooks. Whether its preparing dinner for an ordinary Thursday night, appetizers at my cousin’s graduation party, or perfectly crafting a flavorful Christmas ham, my mom and dad know what they are doing. I’d like to try to pin it on my age, or maybe try to blame the fact that I may not be needed in the kitchen next to their talents, but it’s clear that I don’t possess the same expertise and artistry. However, I will say that there is one Hamernik holiday baking tradition that I have taken full ownership of in my family when I come home for winter break. I can’t argue that it’s complex, but some may say that it requires some genuine focus and creativity. I am proud to say that every year, I run the “operations” of our annual Christmas cookie decorating jam session. For up to five hours, I lead my mom, dad, and younger brother in rolling out, baking and frosting more than 200 sugary cookies while simultaneously dancing to holiday music and staying warm by the fireplace. It truly is a family affair. On the center countertop in our kitchen, I start by rolling out all of the dough that I prepared the night before. Then, I pick and choose to create snowmen, stars, stockings, candy canes, and trees from our cutout shapes. All of the Christmas cookie metal cutouts came from my grandfather and over the years, the designs have held a special place in my heart. Once the cookies bake to a crunchy-on-the-outside, soft-in-the-inside phase, I let them cool. We try not to eat all of the cookies ourselves throughout the process, but thanks to my Italian grandmother’s delicious cookie dough recipe, it’s always proven to be difficult. These cookies taste spectacular even without frosting, but we simply cannot hold back in adding some more love. Every year, I make sugary white, red, green and light blue frosting and purchase a variety of sprinkles and baubles to add some flair to our cookies. I frost smiles and vests on the snowmen, sparkles to the stars, stripes to the candy canes, and write names to the stockings. I always enjoyed art class in high school and this is another form of artistic freedom for me. At the end of the session, we are left with hundreds of brilliant, intricately decorated cookies. We make sure to point out some of our favorite designs from the other family members and smile at our accomplishments. Reverting back to when I was much younger, I remember my patient father carefully showing me how to use the roller to spread out the cookie dough, adding a generous sprinkle of flour so that it wouldn’t stick. This warm, little memory, among many others I associate with our cookie decorating, has stayed with me. When I see the snow on Miami’s campus, I cannot help but think back to decorating these cookies with my family while snowflakes fall softly outside our home. I more and more understand the power of family every year I grow older, especially during the holidays. This cherished experience interweaves multiple generations of my family, and I am certain that I will continue the tradition when I have my own. So, this holiday season, I encourage you all to find a special recipe, big or small, that you want to “claim” to make for your family in the kitchen. Make it your own, just I like did. Also, before us Miami students leave for the long winter break, it will be a stressful time for all of us. Thankfully, Miami offers delicious food and a place to gather with friends until we venture back home for the holidays. Make the most of the final days on campus and spread some holiday cheer along the way! Ever thought about becoming vegetarian? As we celebrate World Vegetarian Day, we are looking at the pros and cons of practicing a plant based diet. According to ‘Vegetarian Times’, about 3.2 percent of adults in America choose to be vegetarian and this number continues to grow as people learn more about the benefits of a meat-free diet. There are many different viewpoints on making this lifestyle change, so check out this article titled ‘Should I Become Vegetarian?’. Here at Miami, we recognize and appreciate students and staff making this lifestyle choice and offer vegetarian and vegan options in all dining locations. Visit our NetNutrition page on the Miami University Dining Services website to check out this week’s vegetarian options. Happy Veggie Day! 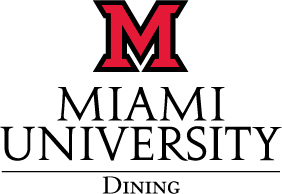 Fall 2018 is an exciting time for Miami University Dining Services as we will introduce several new and exciting locations and menu items as well as updated versions of old favorites. Wings will be available at Red Zone in Armstrong Student Center. StrEATS is a new concept attached to Mein Street that features Asian-style street food favorites. Haines offers a wide variety of Mediterranean inspired build-your-own bowls, salads, and flat breads– make sure to try the specialty hummus of the week! Maplestreet Commons at Maplestreet Station has been expanded to seat more guests and will continue to serve entrees offered in Maplestreet Commons “to-go” at Commons Express. A new, full-service Starbucks location is open on the ground floor of Withrow Hall and construction continues on the Shriver Starbucks (opening soon!). The most popular market items are available at Commons Express, Dorsey Market, Scoreboard Market, and Greystone Market. MacCracken will reopen with traditional market selections and with the additions of hot food offerings, a coffee shop and an ice cream concept. We look forward to seeing you this fall! Q: What is your background like? Personal/Professional? Major? A: I’m from Cincinnati, Anderson Township. If you know where Coney Island is, that area. I started out as a Speech Pathology Major during my first-year and then decided that it was not for me. I switched over to Family Science my sophomore year and am pursuing my Bachelor’s of Science and Family Science and getting a certification as a Family Life Educator. Q: So you want to do stuff with that when you graduate? A: I have secured a position with Booster-Thon. They do elementary school fundraisers, glow runs, 5Ks. You go into the schools and the kids get their friends and family members to pledge a certain amount of money for however far they can run. Then, for about a week or so, we go in and do small group stuff with the kids, leadership and character development types of things. After that week is up, they have the event. You wrap that school up and go on to the next one. Q: How did you get into the food service? Prior experience? A: Yes. In high school—my first job when I turned 15 and a half or 16—I started off as a hostess at a restaurant called ButterBees. I worked there for a while and then worked as a waitress at iHop. My older brother went to Miami and was a student manager here. So when I came here, I knew I had to get a job to put myself through school. On campus seemed the easiest at the time since I didn’t have a car. So I just walked over to MapleStreet and applied. They knew my brother so they hired me right away! Q: What is your actual role? What do you do on a daily basis? A: As a student manager, my role is more of being a leader out on the front lines and dictating tasks in the actual concepts: making sure that everything’s running smoothly, training new employees, that kind of thing. Q: How would you describe your relationship with the other student employees? A: I have a good relationship with the other employees. My fellow student managers are all good friends of mine. There’s a lot of us, around fifteen I believe, and several are good friends of mine. They are predominantly people that I became friends with as a student employee and now we’re working together as student managers. There’s also some employees there that are not student managers that are student employees that I’m good friends with, which is interesting when you introduce that relationship where you’re leading your peers. As a student manager, it’s kind of odd when you’re friends with someone but you have to kind of have authority over them. Navigating that relationship of how do I keep this professional as their manager when I know them outside of work as a friend. Q: How have you found a balance with that? A: Just trying to keep our relationship at work professional. When I was a student employee and I had several friends who were student managers, I understood that if something happened at work that day where they said, “hey, Liz, can you do this or you should be doing that or can you do this differently,” that it was meant and done professionally. I made an effort to not take that personally because I recognize that it’s work and its not personal. So I try to keep those separate. Q: Favorite thing about working for MU Dining? A: All the people I get to interact with! Like I said, I met some of my best friends working as a student employee and as a student manager. The relationships that I’ve made with my managers as well have been really positive for me growing as a leader and as a professional and getting a taste of what the real world is going to be like. It’s been good to learn what it is like to have a boss and how to navigate those relationships and develop a relationship between you and your managers. Q: Any advice for applying/working for MU Dining? A: Definitely apply because, let’s be honest, we’re all in college and we’re all broke. Even if your parents pay your tuition, you still want to have money to go out or get your nails done or whatever it may be. So yeah, definitely apply. It looks really good on a resume, especially if you work you way up to becoming a student manager. That word ‘manager’ definitely catches an employers eye. In a lot of my job interviews, I was asked about by my experiences as a manager. Getting that leadership and teamwork experience and communication was very beneficial. It really sets you up with a lot of skills that are transferable to any position in any field. Q: What are some of your hobbies? Interests? A: Hobbies. It’s funny because I don’t even really think I have any anymore because all I do is study, go to class, and go to work. I guess the regular things like hanging out with my friends on the weekends, going uptown, and having wine nights in my apartment with my girlfriends are my hobbies. In high school, I danced for 15 years, was in cheer-leading, and sang in the choir. I was into the performing kind of thing. But I haven’t had time for that since I have been in college. It’s mostly just hanging out with friends, taking walks, listening to music, watching Netflix. Q: Favorite dish to prepare? Eat? A: In general, my favorite dish to prepare and favorite dish to eat are probably the same, just because you’re going to make the things that you like to eat. But I really like to make and eat green-bean casserole. That is what I make during the holidays whenever we have a big family get-together. Other casseroles like tuna-noodle casserole, too. It’s like tuna-fish, noodles, and cream of mushroom soup. Just those home-cooked carbohydrates. A: Oh, good question. I hate to say it, but my favorite TV show is probably The Bachelor. I’m not going to lie: it’s just so juicy, and the drama is entertaining. You have to recognize that the show is not realistic, but that doesn’t mean that it’s not interesting to watch. And you know they play-up a majority of the drama. Producers coerce contestants into saying certain things just to get the drama going, but it’s still interesting to watch. A: I like animals in general, but I didn’t have pets growing up because my parents thought I wasn’t going to be responsible in taking care of one. But I like cats because I feel they’re easiest to take care of. If I had to go get an animal right now, I would get a cat before I would get a dog because I feel like cats are pretty self-sufficient once you set them up with their litter box. Dogs are really cute too, but I have had a couple of experiences with friends and their dogs and … well, you know, they let the dog run out in the yard and sleep in their bed and lick their face; I don’t think that’s for me. I’m kind of a germaphobe so that aspect of having a dog is not appealing. Cats seem to be more clean, especially if it’s an indoor cat. A: Oh, salty. Potato chips are my weakness. Growing up my parents were, and still are, health nuts: so we didn’t have a lot of junk food in the house. So whenever I get a chance to go out and get chips, I’m excited. At school we had a snack bar in the cafeteria. If you were still hungry after lunch, you could go to the snack bar and I would always go for the chips. Q: What is one thing that every Miami student should have on their Miami Bucket List? A: I think, in general, just experience as much as you can. It’s something that I’m faced with now, the feeling of, “oh my gosh I’m graduating in two weeks and there are so many things that I thought I would do that I never did!” I would recommend doing things that you can only do while you’re here. Whether that’s going to Hueston Woods or things that are specific to this area. Going uptown is a must on the bucket list. You don’t have to drink to go uptown either. Everyone should experience the whole uptown scene at least once: just go dancing with your girlfriends if nothing else. Pfeffer Park is also highly recommended. Basically, anything that’s in Oxford that you might not have another chance to do after graduation. A: I’m from West Chester, Ohio, so not too far from here. I have a major in Individualized Studies, which is like create your own major. Some people hear about it, some people have no idea it exists. My focus is Cyber Security. Miami doesn’t have a program for that yet—they’re working on it—but I’m graduating so I made my own. I’ve been quite involved on campus in terms of organizations. My very first day of college I worked here, so I’ve been in the bakery for four years. Q: So you want to do stuff with Cyber Security when you graduate? A: Yeah! I do have a job set for this summer. It’s an internship but it’s a perfect internship so I’m definitely going to take it. It looks like I could possibly go farther with it too and stay with the company after. Even if I don’t, I’ll be doing something Cyber Security related. A: Well I worked at Wendy’s for a few months. That does not really count at all. Otherwise, no. I knew nothing. I didn’t even learn how to cook for my parents or my family. I knew nothing coming in here. I saw the bakery job posting and it said “work with chocolate” and “work with cookies,” and I said, “okay, okay, you’ve sold me already.” So I applied. But really no prior experience with culinary or baking. Q: Can you describe the student manager process? How did you get the job and what additional training did you receive? A: I’ll give you the short answer to that one. I started out as a Student Specialist as everyone does. There are some Student Managers and some Student Specialists and we all work together. Student Managers are the ones who really know what they’re doing and they’re the ones directing the activity. They know what needs to be done. Student Specialists go around and do all of the stuff. So I worked for about a year figuring things out, knowing what was going on, learning, paying attention. And then, one semester, there was a lack of leadership. I knew what was going on so I kind of took that role and then people started asking me questions and treating me like a student manager because I knew what needed to be done. I went and asked my General Manager about becoming a student manager, kind of inquiring about the official process. Since I was already pretty much doing it, I thought, I may as well go through the process and make it official. My manager agreed and then I did the winter online training. I completed all of my 40 hours of training online, which was a lot of fun over my winter break. After that, I was a student manager for that spring and have been ever since. I’ve gone to the leadership conferences and the training programs over the summers because you have to do that yearly. A: On a daily basis, I make sure everything gets done. We have certain lists for the day, and a confusing thing about those is that some things are written down and some things are not. It is easy to follow a list that is written down, but there’s a lot of things that need to be done and in a certain order that are not written down, which requires a lot of organization: especially when changes happen. In those instances, you have to change your memorization and the team must get together to discuss, “oh, that happened?” You know, you’re figuring out what changed. You really have to be attentive to what happens because sometimes changes happen last minute. In short, I basically ensure that everything gets done and that it all gets done correctly. The team works in one big room for the most part. It’s Student Managers and Student Specialists all working together. I’m really alert when I work, and you have to be. I make sure everyone is doing everything correctly and following protocol, following rules: and understanding priority, too. There are some things that need to be done at certain times, so making sure that they are. And if there are any problems, it’s my responsibility to fix them or figure out how to fix them. A: I try to get to know them on a personal level. In our bakery atmosphere, we’re able to talk to each other. It’s unlike other food positions on campus where you’re kind of doing your own station and you’re kind of stuck, like dish washing or frying. In the bakery, we talk to each other all the time because we don’t do the same things every day. One person will do this thing and the next day, they may do something else. It’s not like you go in and go to the dish-washing corner every day. You go in and do something different. Obviously there are some things that we always have to do that aren’t going to change on a daily basis, but we do things a little differently every day. We can all work on the same thing together or sometimes we’ll split it up and come back together. But we definitely encourage people to talk to each other. It makes it more enjoyable to be at work, and we want everyone to look forward to working. If you can make it more enjoyable, why wouldn’t you? However, we all understand that if something needs to get done, we as a team need to buckle-down and do it. We communicate in a way where we are respectful of everyone. A: It has really allowed me to learn more about myself because I have been here for four years. In high school, I didn’t speak to anyone; I was really quiet. Now, in college, I’m more talkative and I learned that through the bakery and by talking to people there. Every time there is a challenge, you have to work your way through it. It has really helped me grow and I’m really, really grateful for that. I came to college for two reasons: The first was to learn how to be more social and to learn and develop academically. But academics was not my sole focus in college. It was also to become more social because I was really lacking in that aspect. The bakery has helped me with that part. So I would definitely say I have learned a lot at Miami. And in addition to earning a degree and learning from the classroom and non-classroom aspects of that process, the bakery has really, really helped me too. It is definitely a highlight of my collegiate career. If I think back to college, I will think of the bakery first, before any academics actually. I’ve learned how to speak with people and how to solve problems. I’ve learned how to understand that a problem may come from something and then how to fix it before it does. I’ve learned how to figure out what someone’s problem is when talking to them and how to solve it. I can determine why they’re walking toward me and fix it right then and there so a really quick way to make it more efficient. I’ve also learned how to be really, really efficient. But yeah, it has definitely helped in the social aspects. A: Pay attention when you come to work. Come to work and be respectful of it, too. Follow your schedule, show up on time, wear the correct attire. It’s a two-way street; if you’re saying you’re going to work for someone, actually do it. Try to look beyond your job duties and figure out what’s really going on around you because that will really help you learn about the environment that you’re in. A: When I still lived on campus, I was really big into Residence Hall Life like CLT and RHA. Then I moved off campus and that became a void because I was no longer on campus. I am in a sorority, Alpha Epsilon Phi, and I’ve also been really into chess lately. I’m not good: it takes years and years to get even remotely good at it, but it’s really interesting to me! I’ll definitely be spending more time after college learning about chess and playing a bit. That’s one hobby right now, anyway. I’m also President of a Culinary Association. I’ve been in that organization for three semesters now as President. It’s been a great experience too because it’s also helped me grow as a leader. There are challenges and problems that arise, so I’ve had to learn how to handle them. I’m the only administrator, for lack of a better word, so if people have a problem they come to me and I work to find an answer. There’s also a lot of chefs and I get to work with them, which is great. A: I would probably have to lean more toward the bakery side instead of culinary. I definitely like cookies. Just a basic chocolate chip cookie. Or a Reese’s muffin because I’m around that all the time. Pretty much any baked good. A: At the moment, Survivor, because it’s going on right now. It’s getting close to ending so we’re about to know who the final winner is. I’ve been watching Survivor for a few seasons. It’s really interesting watching people interact, the whole social interaction aspect of the show. Like I said, I started learning how to be social in college, which is a really late time to do that. So seeing that in the show—how they all interact and manipulate each other—is really interesting. So yeah, Survivor just because it’s really interesting and fun. It’s relaxing to watch. A: Cat … or kitten, actually. A: Probably sweet, for the bakery part. I like them both, but I have to say sweet. A: They should have a lot! I actually have a bucket list and I have to get it all done in two weeks. Make your bucket list for Miami before your final two months of your senior year. I have so much stuff to do. The biggest thing: hike in Western Woods or just hike around Oxford—Pfeffer Park, especially. It’s really beautiful. The geography surrounding Oxford is actually very special. Pfeffer Park is definitely special, geographically speaking. So yeah, just hike around: preferably when it’s warmer out! Also, watch the sunsets and sunrises on campus. Or go find a location and sit there and wait for the sunrise or sunset and then just enjoy it. We take great pride in this tradition that has evolved since our first meal served. We have become a national leader and the most awarded university in North America over the past decade. We actively research and interact with our customers to be ahead of new trends in concepts and service styles in order to enhance our students’ dining experience. Our dining operations range from restaurants to buffets and markets to cafés. We serve a wide variety of dining options including home-style cooking, vegetarian and vegan options, organic products, international cuisines, as well as smoothies, coffee drinks, and the famous Tuffy’s Toasted Roll. Our on-campus markets provide convenience to satisfy all of your needs. Our dining locations are strategically located close to where you live, study and experience Miami, providing convenient service. Follow our blog here and keep tabs on the latest dining updates by following us on Twitter, Facebook and Instagram.